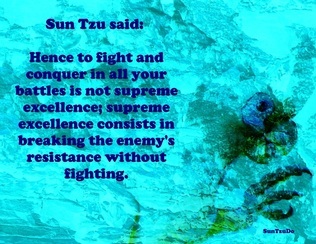 1 Hence to fight and conquer in all your battles is not supreme excellence; supreme excellence consists in breaking the enemy's resistance without fighting. 2 According as circumstances are favourable, one should modify one's plans. Make the most of what comes your way. 3 Manoeuvring with an army is advantageous; with an undisciplined multitude, most dangerous. Be a person others want to work or play with. You don’t have to sell out by being a team player. 4 Spies cannot be usefully employed without a certain intuitive sagacity. Judge thoughtfully everything you see and are told. 5 Thus, what enables the wise sovereign and the good general to strike and conquer, and achieve things beyond the reach of ordinary men, is foreknowledge. 6 The art of war teaches us to rely not on the likelihood of the enemy's not coming, but on our own readiness to receive him; not on the chance of his not attacking, but rather on the fact that we have made our position unassailable. Know that tough times are coming and prepare yourself. Know them and address them. 8 Numerical weakness comes from having to prepare against possible attacks; numerical strength, from compelling our adversary to make these preparations against us. Learn how to become strong. 9 Measurement owes its existence to Earth; Estimation of quantity to Measurement; Calculation to Estimation of quantity; Balancing of chances to Calculation; and Victory to Balancing of chances. Study how to make better decisions and choices. 10 The MORAL LAW causes the people to be in complete accord with their ruler, so that they will follow him regardless of their lives, undismayed by any danger. Be at peace with yourself so you can achieve peace with the world.